duro paint™ Stipple is a patented 100% solids, acrylic polymer-modified, water-based, clean air, inorganic surface coating that delivers an exceptionally tough, durable, UV-resistant, matt finish with a slight stippled texture, supplied in any colour and applied just like normal paints. Compared to normal paint, its main points of difference are that it’s a decorative and protective Long Life Paint - guaranteed for 20 years* (*conditions apply) that does not flake, peel or delaminate and is multi-purpose, absolutely waterproof, high durable, high build, weather, corrosion and wear (abrasion) resistant. This vitreous ceramic-like paint product may be successfully used in the recommended ways on items and materials that are to be later completely immersed in water, chlorinated water, or seawater. It also has high resistance to erosion from running water when used to coat materials used to make water flow forms, artificial waterfalls and sloping water channels. duro paint™ Stipple is supplied as a ready-to-use, 100% active solids powder, duro paint™ Stipple should be thoroughly mixed (using a power mixer) into the specified quantity of clean potable water (drinking water) just prior to application. duro paint™ Stipple should be applied liberally and uniformly to the prepared surface, which should be clean, sound and lightly but uniformly dampened prior to application. duro paint™ Stipple can be applied using standard painting / application methods, including brush, roller, broom, sponge and/or spray (using suitable equipment). For maximum protection, two coats are recommended for most applications. When applied, duro paint™ Stipple becomes 'touch-dry' in approximately 1.5 hours at 23°C and 50% RH (Relative Humidity). At this stage it should be gently hosed with clean tap water to assist with curing and hardening. For maximum protection, it is recommended that this water spray-curing technique be carried out several times intermittently (6 x 10 minute hosings over the following 2-3 days). Recommended mixing proportions for duro paint™ Stipple are 3 parts duro paint™ Stipple powder to 1 part clean potable (drinking) water by volume. It couldn’t be easier! duro paint™ Stipple is supplied as a powder and for use three (3) parts by volume of the powder is thoroughly power mixed into to one (1) part by volume of drinkable water. Prior to use, the liquid paint thus prepared is allowed to activate - at average temperatures for typically 15 to 20 minutes prior to remixing for 5 minutes. This tough, high build paint product proven in performance over 20 years of successful use and having a subtle, slight ‘sandy’ surface texture, leads some regular users to refer to it as ‘paint-on’ wall ‘plaster’, mortar-like ‘render’, paintable ‘liquid stone’ or ‘liquid concrete’. Do I need to use more than one coat? Although not essential in every case, for maximum lasting qualities in exterior situations, Ability recommends the application of two (2) coats or layers. 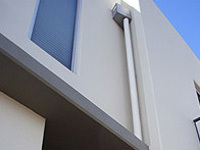 However, except for rough and/or pitted surfaces, wood, metals, rigid plastic foam, foamed concrete, and AAC - autoclaved aerated concrete products, the surface to be coated doesn’t usually need to be primed with a separate priming paint, and although permeable to water vapour, because of its absolutely watertight nature to water as a liquid when fully hardened, it is not necessary to give duro paint™ Stipple a clear ‘sealing’ over-coating unless the matte, flat finish needs to be changed to a glossy, semi-glossy or low sheen finish. If a semi-glossy to glossy finish is required you can ask for printed information about Ability’s AQUAdura clear coating. Not only is it a cost-effective way to protect surfaces from corrosion, erosion and wear, it insulates them - both thermally and acoustically. Does duro paint™ Stipple come with any type of warranty? Ability Building Chemicals is so confident about the lasting and protective qualities of duro paint™ Stipple that we provide a guarantee of 20 years against flaking, lifting and peeling when duro paint™ Stipple is mixed and applied as recommended to a vertical surface according to Ability’s Applicator Booklet specifications which are included with every pack of duro paint™ Stipple . On building components and materials such as exterior walls and vertical structures, duro paint™ Stipple should last indefinitely. This includes these and other items, which are permanently located under water - even under sea water because the matrix of the applied, fully hardened product is so pore free and impermeable to liquids, yet flexible and highly adhesive, as well as being UV resistant, highly resistant to chemicals and unequivocally watertight. It is also when fully hardened water-repellent, even in salty marine air or in acid rain environments. It makes a great swimming pool paint. Our guarantee for pavements and ramps is a period of 10 years. duro paint™ Stipple can be made available by Ability in virtually any colour. If you can imagine it and supply a sample of a material which shows it, we can provide it! It is literally possible for us to produce the product in millions of colours and shades. And we offer a free colour-matching service. Please note that duro paint™ Stipple is not available as a transparent clear product. If you are interested in a clear coating, Ability offers AQUAdura and Duro-Seel Clear coating products. Is there a similar coating available without the stippled texture effect? Yes. It's called duro paint™ Matte. This Ability surface coating product similar to duro paint™ Stipple typically gives a natural looking cementitious (cement-like) matte, flat, basically smooth finish. Just like duro paint™ Stipple , duro paint™ Matte is not available as a clear product but it has all the features and benefits of duro paint™ Stipple but offers a smooth finish. Durosheen® offers an ultra smooth, low sheen finish version of these paints. What type of samples are available for duro paint™? Complete printed information, a few free no charge ‘brush-out’ cards showing the applied product in various colours and a free sample of the duro paint™ Matte in a preferred colour will be made available upon request. Providing that the colour of duro paint™ Stipple is derived from one or more of Ability’s large range of colourfast abilox® UV resistant mineral oxide powder colouring pigments, the answer is - no! Is duro paint™ Stipple safe to use? Absolutely! Water based duro paint™ Stipple in the terms of our specific duro paint™ Stipple Safety Data Sheet may be accurately considered a cleanair non-hazardous and non-toxic, and is an extremely low VOCs (volatile organic compounds) product and safe to use. It’s water based and it contains neither chemical solvents, or gives off noxious, smelly fumes. However, because it’s alkaline, suitable clothing - especially eye goggles, gloves and all precautions should be taken by all users to prevent harm to persons who’s skin may be adversely affected by mildly alkaline materials. Because the drinkable water used to mix with duro paint™ Stipple powder to make it into a liquid paint is not intended as an evaporating solvent, but is in fact the safe, vitreous, ceramic-like, paint-making reactant. It is uniquely solvent-free. Therefore, it doesn’t emit climate changing green house gasses. Can duro paint™ Stipple be used indoors? As a clean air paint, duro paint™ Stipple contains no noxious chemical solvents, so you can confidently use it indoors, knowing it will be virtually odour-free and have no bad-smelling fumes. Even as you apply duro paint™ Stipple you can breathe easy! Applied uniformly and evenly by a master painter, it’s considered by many people to be a most suitable product for decorating and improving the ‘look’ of common plasterboard used for internal walls - especially with suitably high artificial lighting - to enhance the resulting coloured, subtle stipple textured surface effect. Can duro paint™ Stipple or other Ability paints be used for refurbishing and patch-up jobs? Yes. In fact, our view is that there is no better surfacing available for the complete resurfacing of concrete driveways, pavements, sidewalks, steps, ramps, wall and roof restoration. duro paint™ Stipple may also be used to restore fibreglass structures in theme parks and underwater landscape architectural water flow forms as well as for internal floors, walls and ceilings. duro paint™ Stipple is the key to many successful concrete repair applications, especially for in-situ concrete paving or tilt-up concrete wall slabs, which have suffered from rain damage prior to the concrete setting, as well as to solve the problem of subsequent staining or surface damage after concrete hardens. One of our most popular colours, ‘Concrete Grey’ is sold regularly for these purposes. duro paint™ Stipple is also a very high build type paint, it is capable of producing the popular brush / broom applied or ‘bagged-on’ or trowel applied rendered (‘plastered’) ‘look’ for exterior walls - in stunning colours if required. It is frequently used to completely waterproof and fill in cracks in exterior masonry walls and pavements as well as for interior concrete floors etc. If I use duro paint™ Stipple as a colouring paving paint on my driveway at home will it come off in spots after a year or two? No. duro paint™ Stipple has little risk of cracking or lifting due to its very low shrinkage, non-thermoplastic, non-softening, flexible characteristics and its super high adhesion. It sticks tenaciously to almost anything. It really works as a superb paving paint successfully - if applied as recommended - for a very, very long time! It also provides very high resistance to a skid and slip/trip hazard in dry or wet conditions, on all horizontal and sloping surfaces - especially stairs and steps. Ask for the excellent, independent laboratory skid and slip testing results. Can a qualified Plasterer or Drywall Contractor mix duro paint™ Stipple powder with sand to make a trowel-on interior solid ‘plaster’ wall finish or durable ‘mortar’ for use in rendering exterior walls? Yes, but they should take care not to use too fine a sand and NO more water than is recommended for duro paint™ Stipple’s use as a paint. Washed concrete sand is recommended and the proportions are usually 1:1 by volume, ie one (1) part by volume duro paint™ Stipple prepared liquid paint to one (1) part by volume of good quality concrete sand. This makes a fine interior trowel applied wall ‘plaster’ with sound absorbing qualities and a thermally insulative ‘render’ for exterior walls. It can also be trowel applied as a 7-10mm thick ultra tough floor or pavement finish. duro paint™ Stipple ’s Product Data Sheet PDS on these sand filled and applied finish mixing procedures is available on this website or upon request. It’s best to ‘run some trials’ and test first to ensure the mixture of sand, ‘duro paint™ Stipple ’ and water are going to perform to your expectations, ie carefully test first before actual use. Ability recommends to always test first. Trials prior to actual use are essential.